Commercial pear production is concentrated in the Pacific Northwest. New York grows approximately 1200 acres of pears, nearly half of which are located in eastern NY. European type pears predominately grown in the state including varieties like Bartlett, Bosc and D’Anjou. Asian pears, also known as “apple-pears” because of their apple-like texture, are grown on a few fresh market operations. 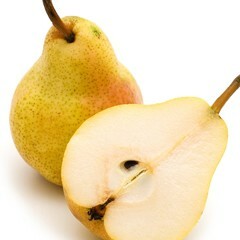 U.S. per capita consumption of fresh pears was 3.2 pounds in 2009. Per capita consumption of all pear products was about 7 pounds in 2010. About 60 percent of the U.S. pear crop is sold as fresh and 40 percent is processed, primarily in the form of canned product.